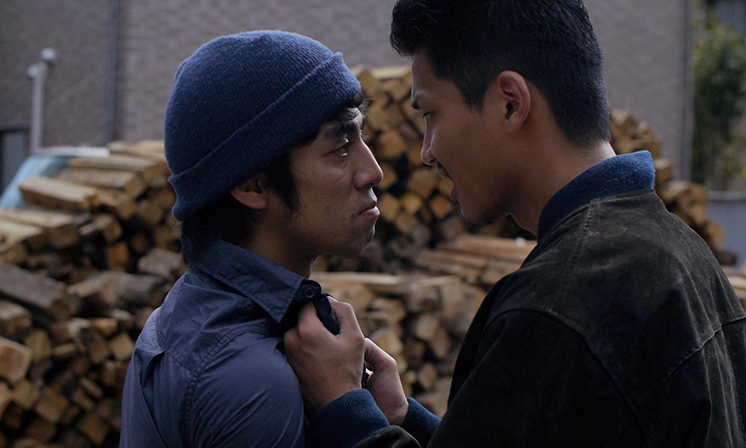 Dropped right into a car mid-conversation, the director does do a good job of quickly establishing three very distinct personalities in an opening scene where Ken (Shinsuke Kato), Kazu (Katsuya Maiguma) and Teru (Kisetsu Fujiwara) fashion a turf war altercation to rough up drug-peddling competitors. Teru, a naïvely obedient puppy dog who simply follow orders is voluntold to pick a fight and duly takes a beating before Ken, a level-headed and reluctantly willing aggressor, and Kazu, a coiled spring given to violence at a second’s notice, step in. By way of fists and the business end of a hammer the other side are made to understand they should move on elsewhere. In a refreshing departure from the genre, no guns appear at all throughout Ken and Kazu. The street fighting is down and dirty, clumsy and undignified and a camera that sits in close captures all close quarter battles extremely well. These wannabe gangster don’t really know what they’re doing and there’s also no sense of honour between thieves or any suggestion of a samurai code here as grievances over money, jealousy and duplicity see allegiances evolve in an instant. Ignorant, or uncaring, of just how low down the pecking order they are situated, Kazu ploughs forward with an increasingly begrudging Ken in tow, a father-to-be conscious of his nuclear family who wants out of the game. Teru rather falls by the wayside for the majority, content to tinker on cars at the garage which is ostensibly their place of work. But their boss has a boss, who probably has a boss, so challenges to higher-ups made behind backs are not well received which leads proceedings down a darker road. As well as both scripting and helming the production Shoji was also responsible for editing this project and a subtle visual flourish in the opening act conjoins Ken and Kazu’s heads so that they seem almost of one mind, so interconnected that they are of one being. However, this is then let down elsewhere by insufficient character development which doesn’t reflect this same such closeness. Overall, though, impressive visual work is well complimented by a score which moves between diegetic pop music, deep strings and fierce drumming, combined with the reverberating hum of traffic and the wind. The inexperienced haplessness with which Ken and Kazu conduct their amateurish affairs is in itself not a weakness in terms of plot but that Shoji seems uncertain in his presentation of their uncertainty rather stunts the momentum and accumulation of dramatic tension of this film. There is, however, the demonstration of potential here and with a little practice Shoji should be one to watch for the future.